During the late Cretaceous, as sauropods and theropods roamed what would later become Utah and Wyoming, the slab of oceanic crust that had been subducting below western North America for the previous 100 million years began to shallow in its trajectory beneath the continent. This ushered in a new era of subduction tectonics in the region commonly referred to as that of the Laramide Slab. The shallow, subducting Laramide Slab left its own fossil footprint on the land. Now, Jason Saleeby of Caltech says the Laramide Slab owes its uniqueness to having carried a plateau from the distant seafloor, which helps explain why the shallow oceanic slab sheared off a segment of western North Americas continental lithosphere. Geologists in the 1970s and early 1980s first identified the Laramide Slab as a significant factor in the formation of the Rocky Mountains and Colorado Plateau. Through geophysical methods, including testing the depths of the regions continental roots with seismic profiles, they have now determined that the Laramide Slab sheared off perhaps up to 100 kilometers of the base of the continental lithosphere along the southern Sierra Nevada and Mojave Desert region. In doing so, it replaced the sheared-off lithosphere with deep sea-trench deposits that were subducted along with the shallow slab. It also uplifted and denuded the deep continental basement rocks of the region. Such deep-level basement rocks and schists that were metamorphosed from the subducted sediments are visible today in the Tehachapi Range and Rand Mountains. 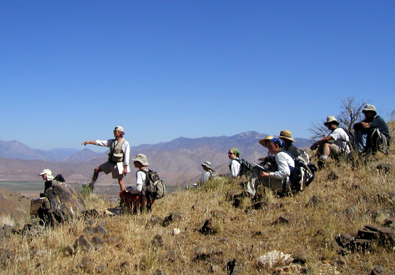 Jason Saleeby (standing) with his Caltech geology field class in the southern Sierra Nevada. The skyline ridge in the center background is currently being investigated as a lower plate remnant of the breakaway zone for the unloading of upper crustal fragments that were shed off the southern Sierra Nevada during the Laramide orogeny. Photo by Ryan Petterson. In the late 1970s, geologists recognized that in order to push and scrape that much of the lithosphere while so far inland from the subducting trench, the Laramide Slab must have been shallow as it went down. Reporting in the June GSA Bulletin, Saleeby suggests a mechanism for such a shallow slab trajectory: The Laramide slab carried with it a plateau of volcanically thickened seafloor. This plateau, Saleeby explains, contained about 15 to 20 kilometers of oceanic crust basalt rather than the usual 5 to 6 kilometers of basalt seen in typical abyssal crust. It not only formed a bathymetric high on the seafloor as it entered the subduction zone, but it also rendered the hosting slab more buoyant, contributing further to its shallow subduction. The slab ultimately scraped and pushed the bottom of the continental lithosphere on its way down to the mantle, creating a mess of mountains at the surface. We see that going on today in the Andes where active subduction is taking place, Saleeby says. Sediments and fossils observed today in the subduction accretion assemblages exposed in the California Coast Ranges host similar traits (particularly fossil assemblages) to those that are intact on the Hess-Shatsky Rise, a large igneous province in the Pacific Ocean, just west of the bend in the submerged Hawaiian-Emperor Seamount chain, Saleeby says. He interpreted this fossil evidence, along with plate histories, to mean that the sediments actually originated from the same place. The Hess-Shatsky Rise, Saleeby suggests, once straddled a mid-ocean ridge, much like Iceland does today, and thus was split during and subsequent to its formation so that one part traveled west toward Asia and the other east toward North America. The portion heading west will sink below Japan and the adjacent Bonin-Mariana Islands in another 50 million years or so. The half of the rise that headed toward North America added thickness and buoyancy to the Oceanic Plate and became the Laramide Slab when it subducted below the continent during the late Cretaceous to early Paleogene. A tour of the Sierra Nevada Mountains, Saleeby explains, reveals northern rocks exposed from a shallow depth and the southern rocks originating from deeper down. While the slab was traveling northeast, the shallow slab segment sloped uphill to the southeast. Upon restoring the Southern California continental basement to its pre-San Andreas fault and pre-Basin and Range configuration, one can see the Laramide damage zone to the continent migrate northeastward from the continent edge to its Rocky Mountain interior as the shallow slab segment progressed beneath western North America, Saleeby says. Along their edges the shallow slab segments warp into a more normal geometry. Saleeby and his students have shown in previous reports that the lithosphere to the north, close to Yosemite, remained intact down to 125 kilometers, while it was sheared off by the shallow slab segment to the south. He based those studies on samples from Miocene volcanic eruptions, which had formed since the time of the Laramide orogeny, bringing fragments of the lithosphere, in the form of xenoliths, to the surface.